Ugh… The weekly water change. There is no denying that it is an essential part of keeping your aquarium happy and healthy. Forget that! A water changer system makes aquarium water changes a breeze! But which one is worth your hard-earned money? Don’t worry! We’ve done the hard work for you. Which water changer is best! It may surprise you to learn that one water changer proved to be unbeatable! What is an aquarium water changer? 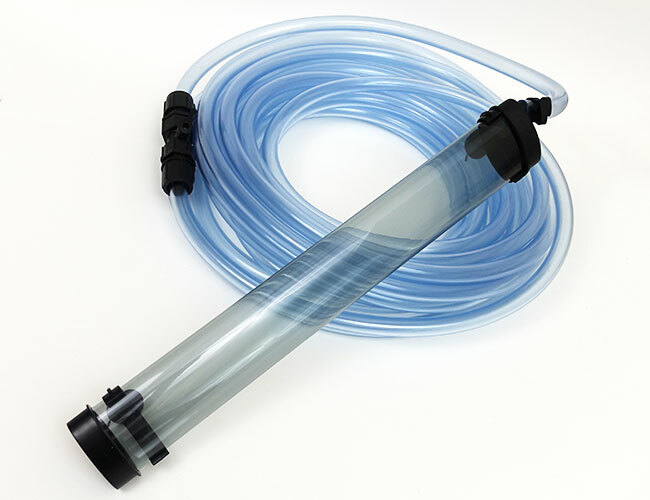 Do you need an aquarium water changer? A water changer is a device that is designed to make routine water changes and tank maintenance an easy task for those with large aquariums. No more lifting heavy buckets during water changes. A water changer is essentially an extra-long gravel vacuum that connects to your faucet. Rather than siphoning water into your bucket, it empties directly into your sink. 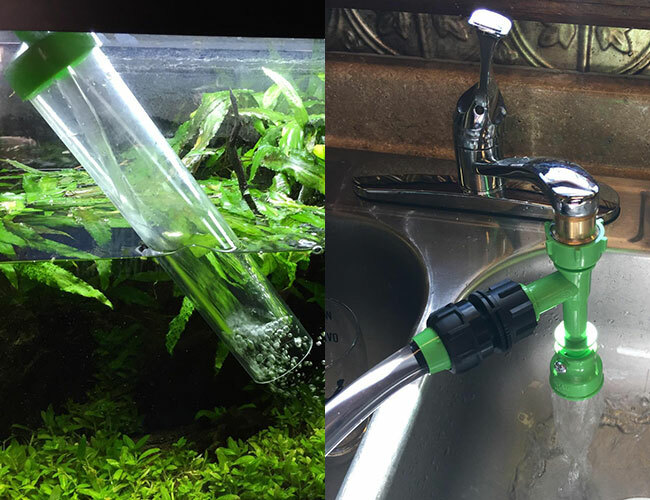 Once finished, you can use your faucet to stream fresh water straight into your aquarium. That’s the simple explanation. 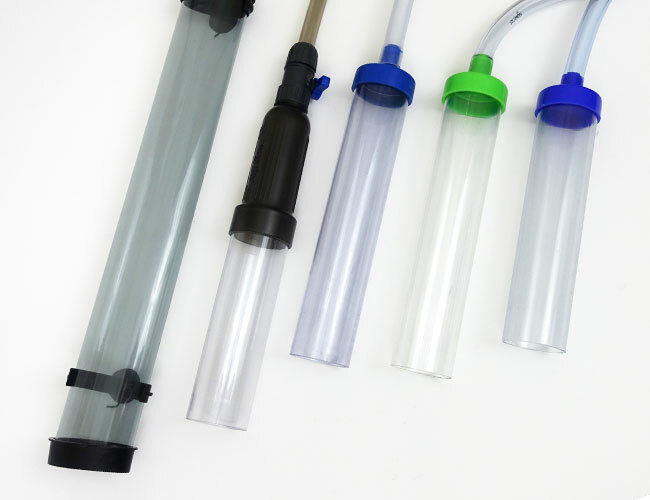 For more information, check out our guide on how to use an aquarium water changer. For a smaller-sized tank? No. A good gravel vac is all you need. If that sounds like you, check out our best gravel vacuum guide. For a larger-sized tank? Well, it all comes down to how much you value your time. I consider it an essential piece of equipment. But then for me to perform a water change, it would require more than a dozen trips between my tank and sink – not to mention the struggle of carrying heavy buckets through my home. Seriously, using a water changer has cut down my tank maintenance by 20 minutes! Still, there is no denying that you can get by without an aquarium water changer – it’s just going to take you longer to perform your weekly water change. If you find cleaning your aquarium relaxing (you wouldn’t be the first!) and like to take things slowly, then this might not be an issue at all. Me? I want to spend as little time maintaining my tank as possible. It leaves me with more time to stare at my lovely little fish. And, my water changer makes the entire process much faster. Ordinarily when we pick which products to test, we have to choose from dozens or, in the case of our aquarium thermometer review, hundreds. But when it came to aquarium water changers, there were only a handful on the market. So, we decided to test all of them! Interestingly, all 5 of these water changers are similar both in design and operation. I guess there are only so many ways that you can style a glorified garden hose. While it is reassuring that all 5 manufacturers believe that this is the best design for a water changer, it made life considerably more difficult when it came to ranking them from best to worst. 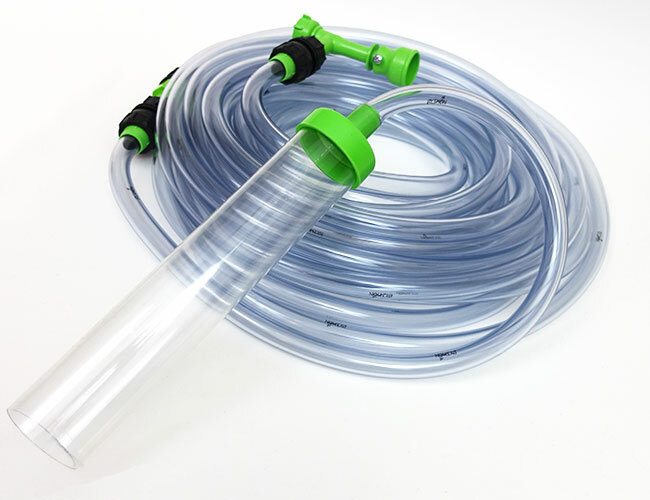 When properly used, each and every water changer we tested was more than capable of siphoning water from our test aquarium and filling it up with fresh water from the faucet – without leaks or mess. And if we were only awarding a pass/fail, then every water changer did what it claimed. But we wanted to go a step further. We wanted to find the best! Build quality – Is it a quality product? 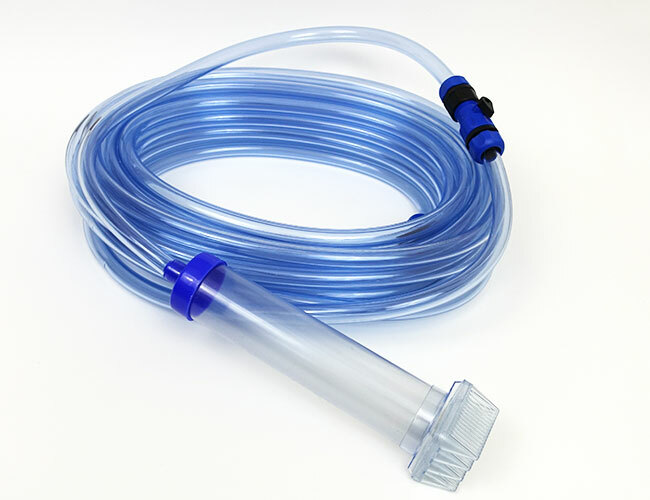 A water changer is disposable, but it should be made from durable components and hold up against typical use. Ease of use – How easy was it to set up, use and pack away? Let’s face it, a water changer’s job is to make draining and refilling your tank easier. Features – What is included in the box? Was this water changer missing any features that were found on the other models? Availability of extra accessories – Does the water changer offer additional parts to make water changes even easier? Availability of replacement parts – Are replacement parts available? You don’t want to buy an entirely new water changer just because a small piece broke. All water changers included a single fitting that connected the water changer to the faucet, like the ones pictured above. They might all look different, but they are the same-sized fitting. It doesn’t fit all faucet types. Don’t get me wrong. It fits what I assume to be the most common type. But there are going to be plenty of you, say with a spray faucet or faucet without threading, that will not be able to use your water changer out of the box. Sure, this problem is easily overcome. A trip to your local hardware store is all it takes to find an adapter or two capable of linking your water changer to your faucet. 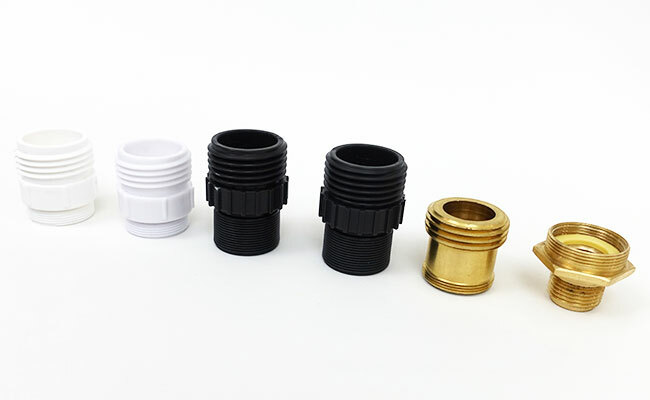 Especially when many of the water changer brands sell the different faucet adapters separately! Given that most brands use plastic faucet adapters, it would hardly be an expensive addition to include them in the box. Don’t get me wrong. If you have a larger tank, then this minor gripe is in no way a deal breaker – I still recommend water changers to anyone who asks. Just be aware that you might need to purchase an additional faucet adapter or two before you can use your new water changer. The Python water changer outclassed the competition by a loooong shot. Nothing else came close. The build quality is fantastic. Considering that Python is right here in the United States, this is unsurprising. The thick solid plastic was more than capable of holding up to everyday use. It’s no wonder some buyers report using the same Python water changer 20 years later. It’s built to last. We were pleased that Python decided to include a brass faucet adapter – it’s much less likely to strip than plastic ones with repeated use. But where Python really shines is its customizability. 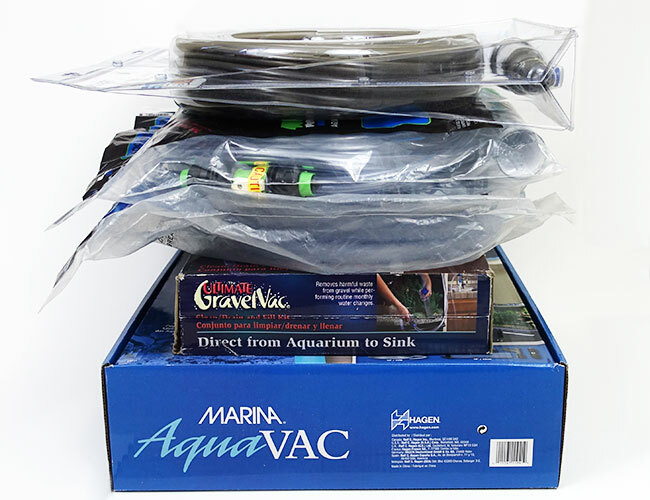 There are many accessories available to enhance your water changer, from gravel tubes that measure a whopping 72 inches to a hook that allows you to use both hands while refilling your tank. Sure, these add to the cost, but the Python water changer is still perfectly usable without them. If something does go wrong and breaks, then you will be pleased to know that Python stocks a full range of replacement parts. In fact, you could build an entirely new Python water changer out of the replacement parts if you wanted. Sure beats replacing the entire water changer! 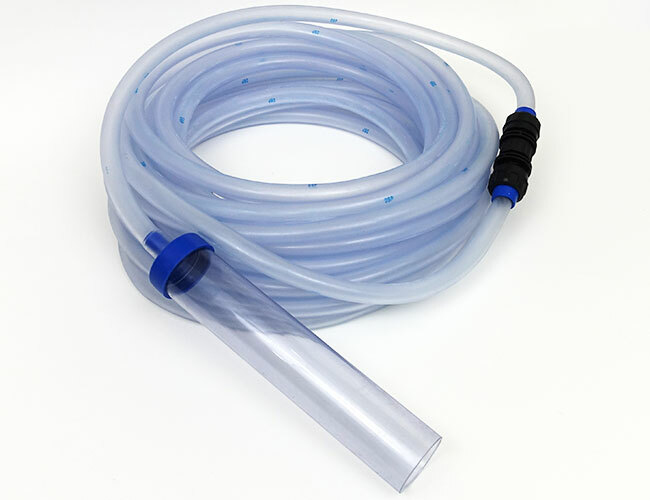 If you are shopping for a new water changer, then this is honestly as good as it gets. Want more information? 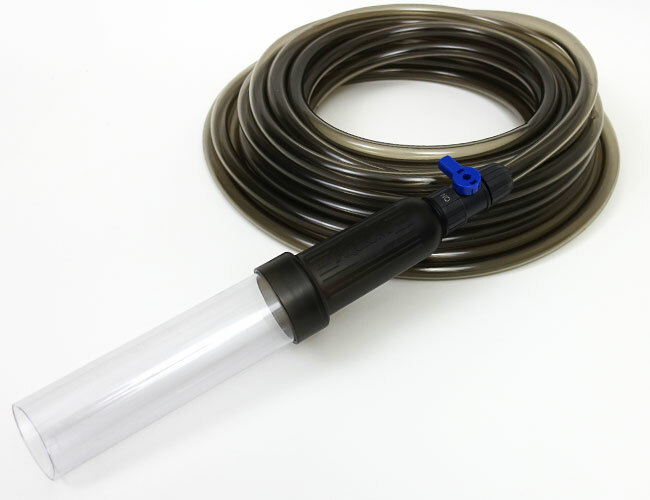 Read our full review of the Python Water Changer. You can’t have a winner without losers. The following aquarium water changers, while capable, were bested by our top pick in one way or another. In terms of popularity, Aqueon’s water changer is right up there with Python. Its packaging is on point and, more importantly, it is the cheapest water changer on the market by a long shot. We also liked the design of the handle used to clean and fill the aquarium. Even more so than Python’s. From plastic fittings that did not hold up to regular use to hosing that gives off a strong plastic smell and easily kinks. Sure, as a water changer, it’s functional, but based on our testing, we expect that you will need to replace it within a year of regular use. It may be cheap, but you get what you pay for. For more information, check out our detailed Aqueon Water Changer review. Lee’s Ultimate Gravel Vac was an all-around okay performer. In an isolated review, it would have been held to a higher regard. However, because it was compared directly to the Python, its flaws were amplified. You would be forgiven for thinking that Lee’s Ultimate Gravel Vac was a differently colored Python… All the parts look very similar. The key difference is that feels like a budget product, and this is reflected in both the materials and hosing used. Lee’s even goes a step further and features something that Python doesn’t offer – a ‘fish-saver claw.’ This attachment, which clips on the end of the gravel tube, prevented curious fish and shrimp from getting sucked up. However, the claw had to be removed during gravel vacuuming because gunk got caught in the small holes. Unfortunately, Lee’s Ultimate Gravel Vac fell short where it counts – it had the shorted gravel tube of any water changer we tested. Where most gravel tubes measured at least 10 inches, Lee’s was a paltry 8.5. If Lee’s Ultimate Gravel Vac was half the price, we would most likely recommend it as a budget water changer. But given that it’s priced similar to Python, which is a noticeably superior product, there is little reason to recommend it. I have to hand it to Marina. They attempted to try something new. Their gravel tube, measuring 18 inches was the longest that any water changer offered out of the box. The tube also came with a removable grill to stop fish and shrimp from getting sucked inside and suction cups to hold it in place during refills. However, the decision to go with an oval-shaped tube was its undoing – the oval-shaped opening made vacuuming gravel substrate more difficult. We did like that Marina included a brass faucet adapter in the box because it won’t wear down like an adapter made from plastic. During testing, one of the gravel tube brackets snapped when we tried to remove the suction cup from the glass of our tank. Hardly a deal breaker, but given that Marina does not offer these as spare parts, it would be nicer if these were better constructed. Like Lee’s Ultimate Gravel Vac, if the Marina Aqua Vac was more affordable, these minor flaws would be less of an issue. But at this price, it competes directly with the Python water changer, and the decision between the two is a no-brainer. I am unsure if it’s by design, but the model we tested came covered in a fine white powder – not something we wanted in our aquarium. Unfortunately, this meant that we had to spend a long time cleaning the Hydromaxx to ensure that every last bit of dust was gone before using it. Despite this, the hose that came with the Deep Blue Hydromaxx was perhaps our favorite of all the water changers we tested. No matter how much you kinked, twisted or stomped on the hosing, it returned to its original state in seconds. But my biggest issue is availability. While Deep Blue manufactures extension hoses, gravel tubes and spare parts, good luck finding them. Or even the water changer for that matter – very few retailers keep them in stock. If you groan about having to do your weekly water change, then think of us. While testing these water changers week after week, we performed hundreds and hundreds of water changes. Yeah, we are pretty sick of them! No other water changer came close in terms of both build quality and reliability. And it wasn’t for a lack of trying from the competition. But despite their best efforts, they could not compare. What water changer do you use with your aquarium? Let me know in the comments below!